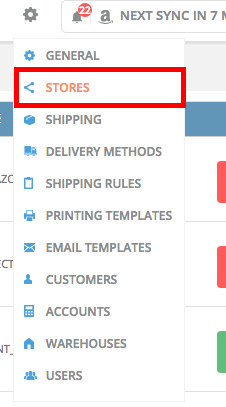 To check your settings so that you can rule out these options as to why your stock quantity may not be updating on your store. There's a number of reasons that may cause your stock on your store to not match the amount that's in Veeqo. This guide will take you through the steps you should troubleshoot in order to work out why the stock isn't matching. Has one of your staff changed the stock level on your store? Is Veeqo set to update your stores stock? Is the store currently active in Veeqo? Do you have stock pushing rules switched on for that store? Has stock level changed since you linked up the listing to the product? Have you got a plugin that could be affecting the stock? Is your listing linked correctly? Are you getting a message in the notification bell? By default Veeqo is not set to update stock on your stores. When you're ready to switch Veeqo on to managed your stock you'll need to do the following for each store you have added. Once Veeqo is set to be master of stock, you should not change stock levels on your store, as Veeqo will overwrite these changes. Any stock changes you make should be done in Veeqo, otherwise your stock may be incorrect. If Veeqo is unable to access your store we deactivate the store. If the store had previously been active you would have received an email notification from us to let you know that the store has been disconnected. The email should also contain an error message to outline the reason why this store is no longer active. The reason why your store has become inactive could be due to overdue payments for your eBay/Amazon/Shopify accounts, or the server for your WooCommerce or Magento store is currently down. If the store deactivates a short time later please check out the Why Does My Store Keep Deactivating guide to troubleshoot this. 4. Then scroll down and hit Save. We would advise to push all stock levels after this. If you link up a new listing to an existing product Veeqo will not automatically push out the current stock level to that listing unless one of the 4 instances occurs. 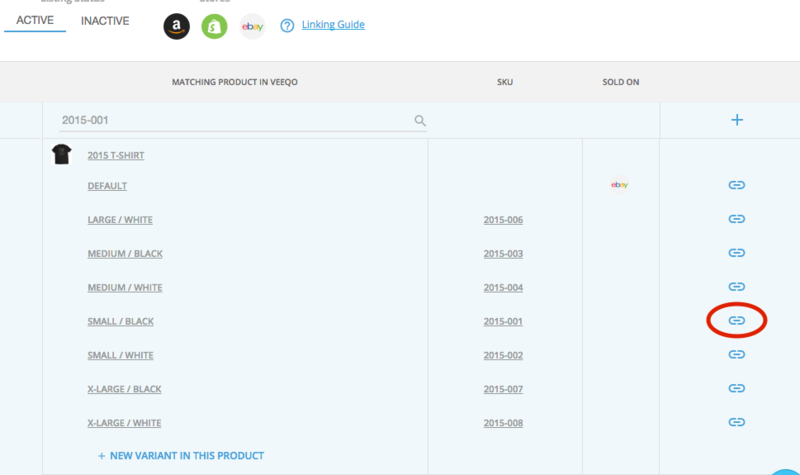 TIP: After you've finished linking up your new listings to existing products we recommend that you check your stock levels in Veeqo are correct then go to Settings>Stores and clicking on the store that these listings are connected to. Then press the Push all stock levels button. This will begin pushing out all the stock levels to every linked listing connected to that store. This ensures that the stock is synced from that moment. 1. 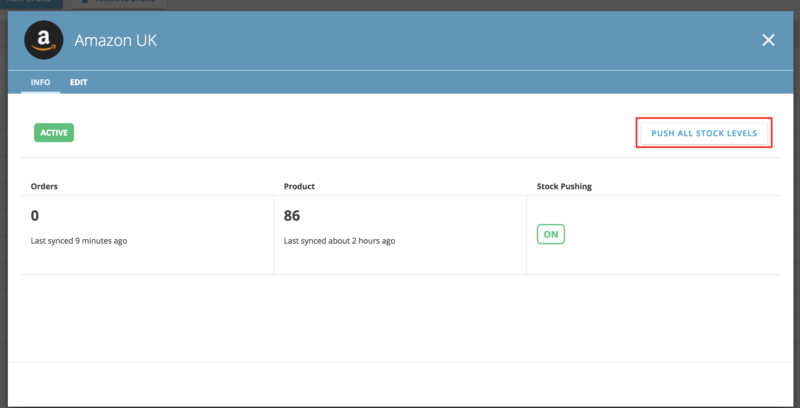 Log into the store that is currently displaying incorrect stock and find an example listing where the stock figure isn't matching in Veeqo. Copy either the product title or SKU. In this example we're having problems with a Shopify listing that is currently showing the wrong stock figure. The SKU for this listing is 2015-001. 2. Jump into Veeqo and head to the Product>Listings page. Here you can quickly see what listings are connected to each product. When the page loads you'll be shown your Unlinked and Active listings by default. 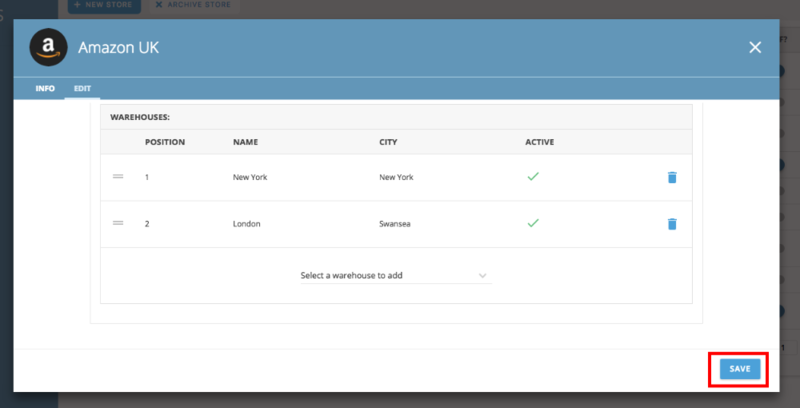 All your listings need to be both Linked and Active in order for Veeqo to pull in orders or push stock updates to them. 3. Search for the product title or SKU in the search bar at the top. What to do if my listing isn't in LINKED & ACTIVE? If your listing is LINKED & ACTIVE jump to the next step! 5. So you've found your listing and it's Linked & Active, which means we're able to push stock figures to it. Now we need to make sure it's connected to the correct Veeqo product. Im this example our SKU 2015-001 is a Small Black T-Shirt, you can see the listing for this on the left hand side of the image below. The product on the right hand side it the Veeqo product that this listing is connected to. You may notice that the listing on the left for a black t-shirt is connected to a grey t-shirt. Another clue that it's connected to the wrong product is that the SKUs aren't matching up either. This means that Veeqo will be pushing out the stock figures of the Grey T-Shirt to the listing of the Black T-Shirt. If Veeqo is able to find a matching SKU it will automatically suggest this link after you've unlinked it. If Veeqo finds the matching product click the Green tick to confirm it, then jump to Step 8. If Veeqo finds the wrong product hit the red X instead and carry on to Step 7. 8. Now that your listing is connected to the right product you'll want to force a push of the current Veeqo stock so that the actual stock you have is displayed on your store. To do this go to Settings>Stores and then click on the store where the listing is from. When the new window pops up click on the Push all stock levels button. This will begin pushing all your current Veeqo stock levels to that store. All correctly linked listings will then be updated with the current Veeqo stock levels. This button can only be pressed once every 24 hours. So make sure all your other listings have been checked and correctly linked prior to syncing the stock. 2. Scroll down to the Product Data section and click on the Inventory tab. Make sure Enable stock management at product level is ticked.